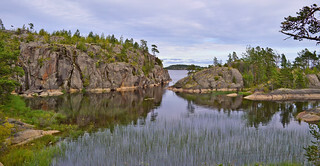 The Archipelago of Lake. View from one of the islands. Autumn. Sorry... sorry, my dear friends 💕. It's too much work in the office now (It's typical for November and for the beginning of December). I don't have time to be here. This photo was taken from another island / cliff (we reached the island by motorboat). 2-day trip on the weekend 2.-3.9.2017. Notice: Ladoga is the largest lake entirely in Europe and the 14th largest freshwater lake by area in the world. There are around 660 islands with a total area of about 435 km2.